First off I wan't to tell you how much I miss you all! I loved all the emails especially all of the ones from you papi:) Thank you for the encouragement and love. Please let the ward family know I am thinking of them. Melanie Day sent me a letter with updates from the ward, her family, and uplifting quotes. It completely lifted my spirits and I could not have been more thankful! 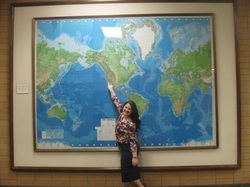 So I cried like a baby when I read about your mission call mck! I am SOOOOOO EXCITED for you!!! and slightly jealous that you get to learn french and talk with ati and los tios haha. How close will you be to los tios? AND WHEN ARE YOU LEAVING??????? Mckay you are going to love it here! it is slightly crazy and confusing the first three days, but after Sunday you get a complete hang of it. I already have a new companion, Hermana Batista, but I only get to be with her for three days until she leaves to el salvador and Belize I feel that we are sisters - we spend the majority of our time laughing oh and studying and preaching the gospel of course. She has been here for 8 weeks and I feel that I am learning so much from her. Our motto here at the MTC for our branch is (M-T-C- Make- The- Change) I feel like I am learning so much and I have only been here for 8 days. Serving a mission is much more than teaching the gospel it is about loving people. It is about loving people the way Christ does and guiding them to come closer to him. I am so grateful for the power of prayer here at the MTC and in my life. Never take for granted what the savior has given you. Pray more and love more! Sunday was fast Sunday so we did'nt have relief society. We had conference after conference which were all very spiritual. My favorite talk was by the MTC president about repentance and the atonement. He also taught about how our key to charity and loving others is directly tied to the atonement and our own repentance. If you can not love another look into yourself and examine your own relationship with the savior. I also learned to never quit- never quit on your investigators, never quit on yourself, and never quit on the savior. I have spent every day here teaching investigators. It was hard at first to take some of them serious because we teach out teachers as if they were non members (sort of like role playing) but it is incredible how as I began to truly apply preach my gospel and pray for help the spirit was the complete guide throughout the lesson. So There are now 5 of us in our district of advanced spanish. I am struggling to teach the gospel in spanish and communicate my feelings and promptings from the holy ghost into spanish. However since day one I have already improved... Although my brain in confused half the time if I am supposed to be speaking Spanish or English. The other day I ordered my food in the cafeteria in Spanish... the guy was very confused! Our zone consists of the advanced spanish class and the intermediate class. We are losing over half of us this week including my companion :( I am hoping we get new people on wednesday. I am absolutely loving it here and am so grateful for the gospel in my life. Thank you parents for raising me right and teaching me to pray and rely on my savior. Thank you Mckay and Krsiti for always being my friend even if we fought and for teaching me by example. You guys are the greatest and I am so happy I get to spend eternity wit you:) and Justine I want you to know I love you and think of you as part of the family! I am so grateful for the friends I have had who helped me become the person today. I also am so grateful I did Oakcrest. Everyday I am here I recognize what a blessing it was in my life and how much it prepared me to teach the doctrine of Jesus Christ and how to bare my testimony. The computer is timing me out, but know I love you and think about you every day! note to all of you- Read the Book of Mormon more!!! It will bless your life and bring you closer to our savior! also remember that the most imporant thing in this life is people- how we love them and invite them to come unto christ.